The Gambescia family, from the book “Every child, no matter how many, is special,” by Stephen Gambescia. What is it like to be raised in a family of 16 children? More to the point, what does it take to parent 16 children? These questions, especially the latter, are answered in a slender book, “Every child, no matter how many, is special,” written by Stephen F. Gambescia, a professor of health services administration at Drexel University (order here at Amazon.com). The book is about his own birth family of seven boys and nine girls (of which he was child number 12) born between 1945 and 1964. Curiously, although the baptismal name of each child is listed on the last page, such other details including his parents’ names, and where they lived are not mentioned because he feels it would distract from the narrative. His intent is to represent all parents of large families. Since most people would find these details pertinent, checking other sources including another book on his father’s writings and material easily found on the internet, it can be said his father was Dr. Joseph M. Gambescia (1919-1991), who was a physician and professor of medicine, and his mother was Mary Elizabeth (Botto) Gambescia (1921-2000). His dad was of all Italian heritage, his mom of Italian and Irish descent. Both were devout Catholics. It came early for Mary Elizabeth, but for Joseph, early schooling was in public schools without formal religious training. But as a young adult he had a spiritual awakening. While attending graduate school at Villanova, courses in religion were required and initially he took them simply because he had to. “His curiosity was piqued, and he suddenly became interested in Jesus as he was presented in the theology courses,” his son writes. Joseph and Mary Elizabeth met at Hahnemann Medical College in Philadelphia where he was completing his education and she was a nurse. They married in 1944 and lived for much of their married life in Bala Cynwyd. Clearly, with a family of ultimately 16 children, life must have been hectic, although the portrait Stephen Gambescia paints of his mother is of a serene, competent and very organized woman. It was a happy marriage, according to their son, and he never heard a cross word between his parents. Learning was important in the household. Every child at a very young age would receive not a bicycle but his or her very own desk, and their father would question them closely every night at the dinner table on what they were reading. In her wisdom, their mother would prepare each child’s dinner plate because she knew their likes and dislikes and would serve accordingly, lest their sterner father would insist they finish things they disliked. Prayers before meals were lengthy and varied, at times filling a long sheet of paper and covering a range of themes. Dr. Gambescia also played a role, through his medical knowledge, in the canonization of St. John Neumann. He also wrote extensively on the technical aspects of the Shroud of Turin. On occasion the family would be invited to dinner at the residence of Cardinal John Krol, who was one of Dr. Gambescia’s patients. There the prayers were shorter and the dining room table, while impressive, was smaller than the one at home. Truthfully, there were very few other invitations to dinner. How many people have the room to invite a of family of 18? 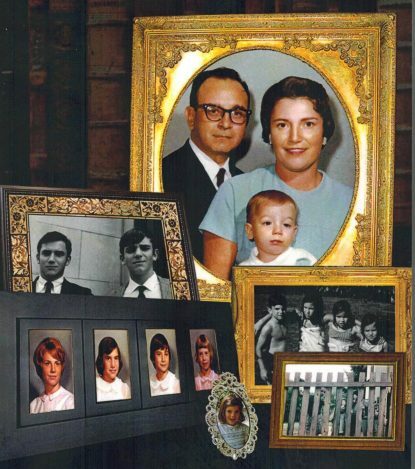 The one thing that really stands out in the Gambescia household was something common to most large families. That is the sacrificial role played by the older children who willingly assisted in care for the younger ones, and as they moved on that duty fell upon the middle children. Because the family was so large, it was insular. For example the children did not have birthday parties to which they invited friends because the family gathering was sufficient for a celebration in itself. There were summer vacations at the Jersey Shore, usually a different place each year. Sometimes landlords could be wary. Why would these people want a house with so many beds? Were they fronting for underage kids expanding senior week? Late in his life Dr. Gambescia became an ordained permanent deacon, and it was a fond wish of both parents that some of their children would enter religious life. Despite many hints, this never happened. But on the other hand there are now a ton of grandchildren and great grandchildren to keep their memory and values alive.